Sunflower sprouts are delicious, nutty, and full of flavor – you can sauté them with soy sauce and toasted sesame oil, put them fresh in salad, or put them in a sandwich. You can make butter out of the seeds, eat them roasted and salted, or turn them into bird food. According to the National Sunflower Association, the sunflower market was valued at $450 million dollars in 2009. I just wish I didn’t have to wait 12 months to grow more after realizing the economic benefits of growing your own. I adore sunflower sprouts and I could have grown enough seeds to keep me in sprouts till next harvest, if I had only known. It costs $3 for a serving of about 30 sprouts at the farmers market, or $.10 per sprout. 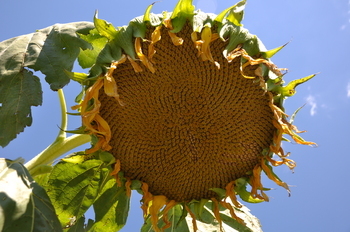 One sunflower head, if you are growing a large one like the Mammoth varietal, can provide 200-400 seeds – which can all be sprouted. A packet of 20 Mammoth sunflower seeds costs $3.95 (let us say $4). Each seed therefore costs $4/20 = $0.20. 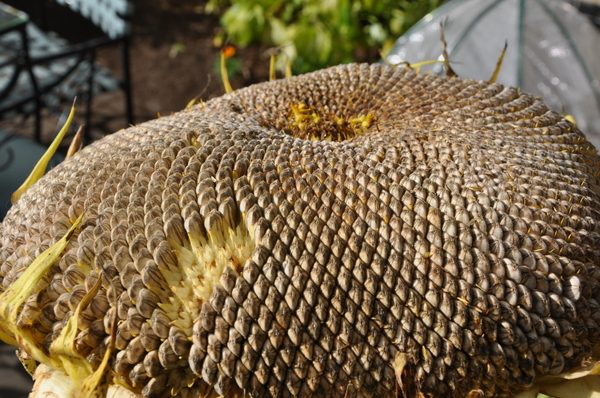 That one seed can grow to a giant sunflower head which can yield you ~300 seeds when you harvest it. You can sprout those seeds yourself, ending up with 300 sprouts, which at the market would cost you $.10 per sprout, or $30. Your $0.20 has become $30 worth of sprouts, with a little time, patience, and watering. Therefore, your profit from that one seed could be $29.80, which is a 14900% return. That is an incredible return on your cost. Living life with the seasons is a powerful antidote to the culture of immediate gratification, and for the most part I am content to wait – but sometimes, when I think of all of the sunflowers I could have grown this year, that it is going to take 12 months to get here again, had I only known about this in May, that I really love sunflower sprouts – I am not content to wait. This entry was posted in On the Farm and tagged Corinna Borden, eating locally, Real Time Farms, sunflower. Bookmark the permalink. I also wish I had known this about sunflowers before. Yesterday was the final harvest of my garden (well, I still have some chard and broccoli), but as usual I am already thinking about plans for next year. I will have to plant some sunflowers for sprouts and for cheer.